WHY DO I NEED CONTINUING EDUCATION? Continuing education requirements can be different for each certification agency. But the premise is the same, all certifiers require that continued competence be demonstrated through CE. For your participation in CE, you receive Continuing Education Credits (CECs). CECs are required for personal trainer recertification. You have to get CECs in order to keep your CPT credential (because losing it will affect your job, your insurance policy, and your reputation – we’ll help make sure that doesn’t happen)! HOW DO I GET CONTINUING EDUCATION CREDITS? 2.0 CECs are needed each year. 1 learning hour = 0.2 CECs (so you need 10 hours of learning activity each year). You can get these hours in so many different ways that we can’t possibly list them all. But here’s some of the most popular CEC activities: NFPT Self-Tests and Other Free Sources, Courses / Classes, Workshops, Seminars, CPR/AED Certification, Proof of Insurance, Writing CE Articles. If you take the time to do an exercise science or fitness business learning activity, we’ll give you the credit!! CAN I GET CREDITS FOR NON PRE-APPROVED PROGRAMS? You may choose to submit a learning activity which is not pre-approved by NFPT for CECs, that’s okay! There is no petition or submission fee for our review and approval! We will review your submission and determine your credit award (CECs) based on 3 things: Participation Hours, Recognition of Learning Activity/Provider, and Relevant Subject Matter. If your activity meets the criteria for these 3 areas, then you’re good to go! HOW DO I SUBMIT MY CREDITS? Submit documentation for CECs through your online NFPT account, or by snail mail or email at [email protected] Documentation could be in the form of a certificate of completion, transcript or confirmation letter – heck, take a picture of the doc with your smart phone and send it to us, we’ll accept it that way too! As long as you provide us with the document/s/ that shows us what you’ve done and with what company/presenter you did it through, get it over to us and we’ll award you the credit! There is no fee associated with submitting your CEs which is unique to NFPT! 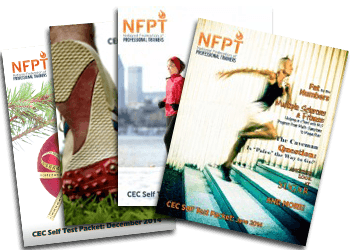 NFPT Self-Tests are free, optional quizzes consisting of about 50 questions. They are published twice a year in June and December. Questions cover continuing education articles that we publish on the NFPT Trainer Blog. The tests are taken through the online account. Score 80% or higher to be awarded 0.5 CECs. Take both self-tests and get 1.0 CECs each year at no cost. The Trainer CE Refresher Quiz is a ‘back to basics’ 120 question quiz that you can take through your online account. But, don’t worry, it doesn’t need to be done in one sitting. It covers the latest edition of the NFPT Personal Fitness Trainer Manual and acts as a refresher of your trainer knowledge. A free monthly quiz where you identify the problem depicted in an image. The ‘flop’ could be incorrect form or incorrect client:trainer etiquette – identifying the wrong way reinforces the right. Correct answers are awarded 0.1 credit. Easily get half your annual CEC requirement by participating each month. Is Personal Training Right for Me?